On what turned out to be a rather spontaneous decision, we threw off the docklines and headed south towards Port Sheldon and Pigeon Lake. The crew consisted of Erin, Hannah, Isabel, Shasta and I. The weather forecast was perfect...10-15 knot winds out of the north with waves 1 foot or less. We rounded the south pier head of Grand Haven at about 11:30am and enjoyed a perfect broad reach for 8 nautical miles to Port Sheldon. The wind and waves were so very right that day that we did not even once take a tack or pull on the jib sheet. Just awesome sailing! Port Sheldon is listed in the chart books as simply a "port of refuge" with no services or marinas. Fair enough, we were looking for a bit of relaxation and quiet before the busy holiday weekend that lay ahead. The channel into Pigeon Lake is a bit narrow and sometimes shallow, but well worth navigating because of the clear blue water and narrow sandy beaches on the shorelines. We motored down the channel and into Pigeon Lake proper. 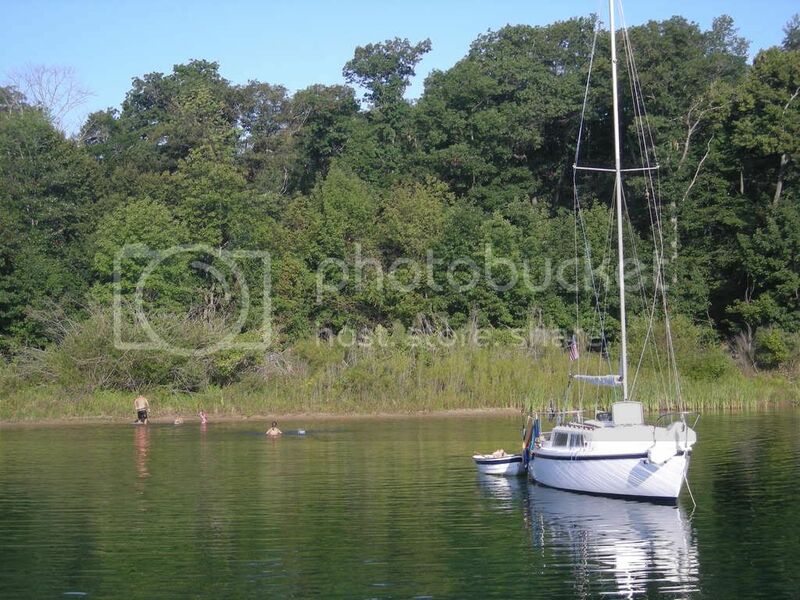 Just inside the lake to the north side is a nice little cove that is perfect for anchoring. We dropped the hook in about 12 feet of water and promptly took Little Coconut ashore for some exploration and a shore lunch. Little Coconut is a small but very row-able dinghy. She just barely holds the four of us, so Shasta (our golden retriever) was "forced" to swim in along side of us. This may sound a bit cruel, but if you know Shasta you know that we suspect her of having gills and webbed feet. The northern shoreline of Pigeon Lake has a very nice boardwalk along a narrow sandy beach that stretches for about 1/2 mile. We ate our picnic lunch one of the many benches along the boardwalk and scoped out the best place to spend the afternoon laying around on the beach. By the time we made it back to Hannabel, the anchorage was starting to fill in. In fact, by nightfall there were about 12 boats total. Some new friends of ours from our marina even showed up in their Pearson 30 named Whispurr. I spent a few minutes in the diminishing dusk light with my mask and snorkel on scrubbing the bottom of Hannabel. The water in Pigeon Lake was so clear and inviting that I couldn't resist the evening swim. After our dinner of grilled catfish, garlic bread and salad, we enjoyed a Dark & Stormy (rum & ginger ale) in the cockpit as the girls played in the cabin. As the sun set on a perfect day, Marc, Marilyn and their two kids (from Whispurr) joined us in the cockpit for an hour or so of laughter and fun. We woke the next morning to a very serene lake with a heavy fog concealing anything more than 50 feet away. After we all had breakfast, we took a morning bath/swim in the lake. There's nothing more refreshing than an early morning swim in a clear, calm lake! It's wasn't long after 9:30am that we had Hannabel headed back towards Grand Haven. As luck or King Neptune would have it, we had a light 8 knot breeze out of the south/southwest and were able to again enjoy a tackless broad reach all the way home. In fact, the sailing was so smooth and peaceful that the girls enjoyed at least half of the trip in the dinghy as it was towed behind Hannabel. 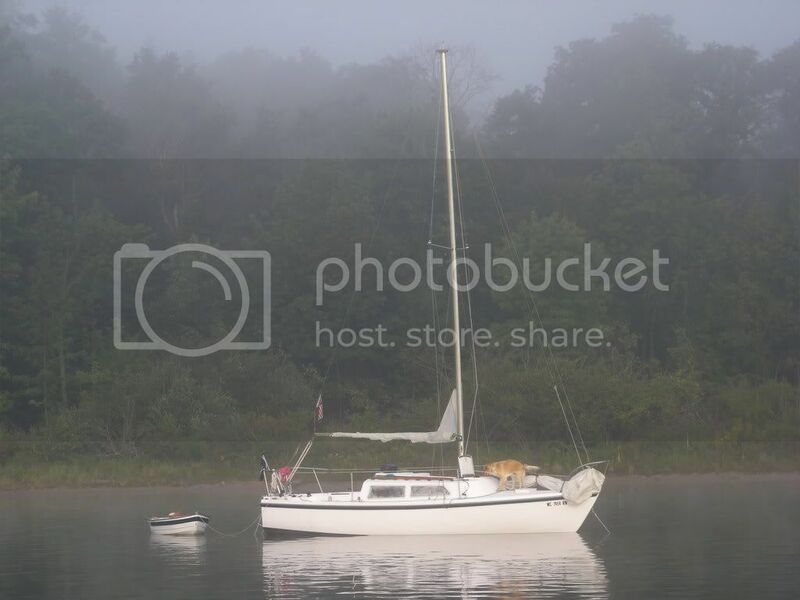 Good friends, good sailing and a peaceful anchorage make for a very memorable late summer voyage!